You are here: Home / Blog / Sweets / Vegan Pumpkin Bread – Well Hello, Fall! This week I’m all about pumpkin, because Wednesday I shared the ultimate list of pumpkin recipes with you. 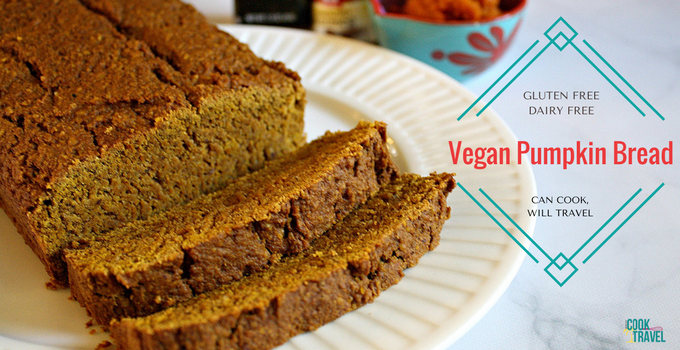 And today I’m making a vegan pumpkin bread, because I just had to give it a try! 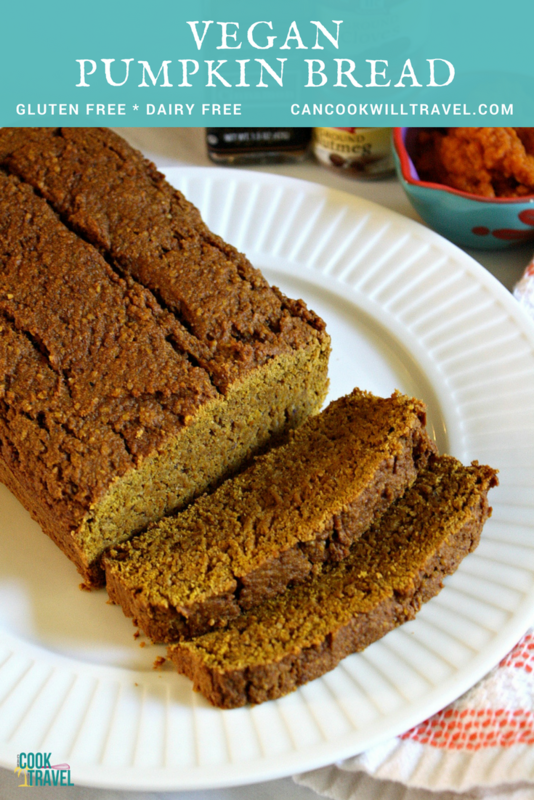 This pumpkin bread is also gluten free, which is even better! I was going to try my hand at my own version of vegan, gluten free pumpkin bread, but I ended up finding a recipe to try. And holy smokes Demeter at The Beaming Baker tested and tested until it was perfect, so I owed it to her to try her recipe. I have to say that it was pretty fast and easy, honestly. I wanted to bake this on a Sunday so we’d have it for snacking on a little Sunday afternoon while watching football. So I was trying to get the vegan pumpkin bread in the oven before my boyfriend arrived, and clean up my kitchen. Luckily that happened, because the bread needs to bake nearly an hour, and I was getting hungry for lunch. Haha! Baking up this bread was a snap, and I loved that you did it all in one bowl. Just combine the wet ingredients including pumpkin, coconut oil, maple syrup, coconut sugar, flax egg, and vanilla extract, and then stir in the dry ingredients. The dry ingredients consisted of oat flour, where I was all prepared to make my own, because I couldn’t find any. But I ended up seeing a bag in my pantry (yay!) and had enough, so that saved me time. You also need almond meal (coarsely chopped almonds), baking powder, baking soda, cinnamon, nutmeg, cloves, and salt, and then once it’s combined it’s poured into a bread pan. Now you may have stopped at the flax egg ingredient above, and that’s cool. A flax egg consists of ground flaxseed and water. Just stir it together, and let it sit 5 minutes so it forms a gel-like consistency resembling an egg. If eating vegan isn’t your priority, then just use an egg. I was just curious about how the flax egg would turn out, and it was great! The recipe gives you instructions for 2 loaf pan sizes, and I went for the larger one and the cook time was spot on. So in 55 minutes, my bread was cooling and we were off to grab pizza and beer and watch some football. I was a little nervous to serve up the vegan pumpkin bread to my fella, because he doesn’t pay attention to gluten or dairy. But in an effort to experiment, and get an unbiased opinion, I didn’t tell him and he seemed to enjoy it! The vegan pumpkin bread tastes spicy (although next time I may add more spices), and the texture was moist. And I couldn’t tell that it was gluten-free, because the oat flour and almond meal gave it enough structure and texture to hold it together. I love using coconut sugar, and using it plus maple syrup is a terrific way to avoid refined sugars. Eating lots of sugar creates an unhealthy addiction, but our society eats it up without much thought. So when I can at least control eating it at home, I feel a lot better about what I make. That’s not to say I totally avoid sugar, because I don’t and on occasion will partake. But to me it’s all about balance, portion control, and not being insanely strict. Indulging is totally okay when done on occasion. This bread isn’t uber pumpkin-y, which I really like. It’s just got that lovely Fall spice about it that’s hard to beat. I plan on slicing and freezing at least half of the bread, so I can enjoy it even longer. Plus I won’t eat all of it, and I don’t want it to go bad. I’ll update the post later about how the freezing works! UPDATE: Freezing worked great! I used parchment paper to separate the slices of bread and it really made eating a little at a time a breeze. And I reheated the frozen bread in my NuWave oven for 5-6 minutes, then it was perfect! So when you’re in dire need of some pumpkin bread, this is the one to make! That way you can both enjoy the delicious flavors, and be mindful of the ingredients you’re using. 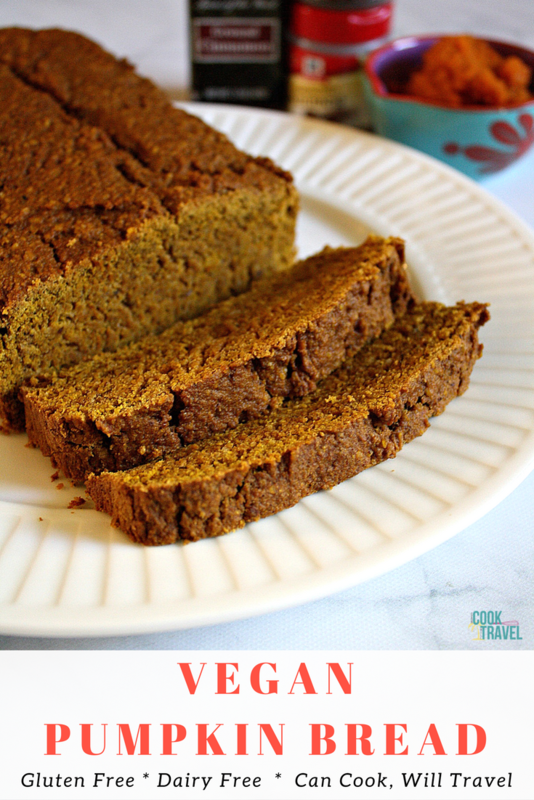 Check out this Vegan Pumpkin Bread recipe along with step by step photos, and then happy bread making!! Two years ago: Earl Grey Scones with Lemon Icing – Cheerio, Love! Five years ago: Sinfully Good Dip!